For the A4 B8, Audi has made some very significant changes to its powertain. Just as Porsche has developed increasingly sophisticated solutions to overcome the fundamental imbalance of an engine overhanging the back wheels, Audi has had to do the same job at the front. Worst of all were the old iron block five-cylinder Audi 100 diesels that much preferred to go straight on at corners than actually change direction. Fortunately, for most of us, these are no more than a memory. Audi has continually been getting better at dealing with its disability and had all but disguised the ponderous pendulum effect of its overhanging engines in the final incarnations of the A4 B7. But its big breakthrough came earlier this year with the A5. The engine still sits out in front of the front wheels longitudinally, but, by moving final drive further forward, the weight of engine and transmission is better distributed between the front wheels. How they do this is to take drive from the back of the gearbox, then run a propshaft forward to a differential that sits on the right hand side of the flywheel, with the left driveshaft running between the engine and the flywheel. Next year’s A4 shares this new drivetrain, as well as a longer wheelbase than past Audis and much improved front suspension, now 5 link in aluminium, with a steering rack repositioned in front of the engine so steering input is fed more directly to the wheels. 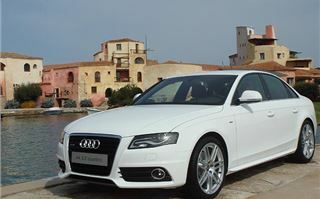 But, of course, the A5s tested earlier this year were all quattros. 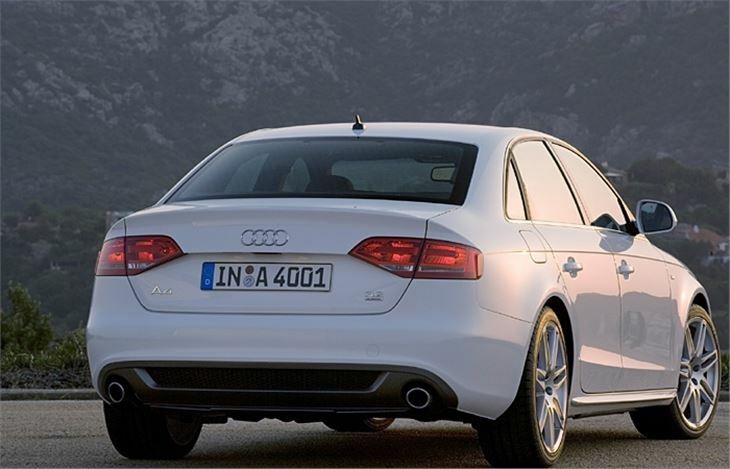 The new A4 is the first incarnation of Audi’s new thinking applied to front wheel drive as well as to quattros. So is it in the same league as the latest Mondeo and Renault Laguna? I took an early flight south to find out. The trouble with any of these international events is the mad scramble for cars. You simply don’t get what you want when you want it and you’re lucky to drive a reasonable selection of what your country will be getting. I wound up with a 1.8TFSI front-drive Multitronic for the short drive from airport to hotel, a car not in the first UK phase. Then a 3.0V6 TDI quattro manual. Then a 1.8TFSI front-drive manual. 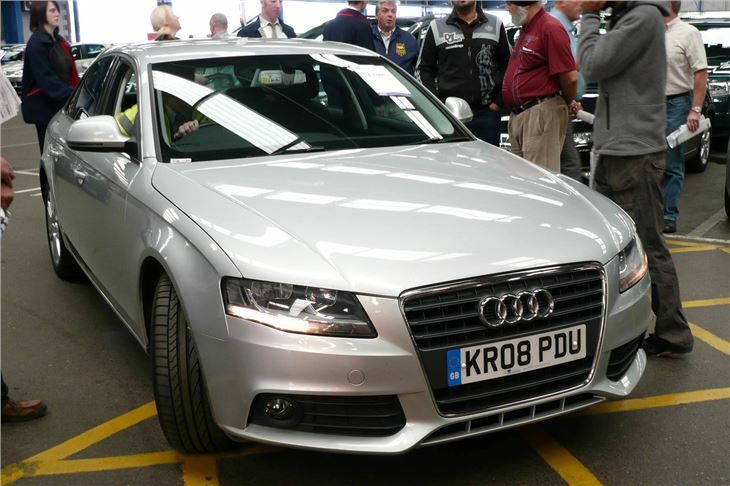 Then a second 3.0V6 quattro manual. Next day, first crack of dawn, I had my towels on the seats of a 1.9TDI 143 front-drive manual and a 2.7V6 TDI front drive Multitronic. Worth noting is that the new 160PS 1.8TFSI engine is held together by a chain rather than a belt. So no need for expensive 4-year belt changes. The only little belter left in the line-up is the 2.0TDI that will later be offered with three different outputs up to around 175PS. Also to come in the not too distant future are 2.0 chain-cam TFSIs and versions that will run on CNG and Ethanol. Among the car’s new features Audi offers a system it calls ‘Audi Drive Select’ that, as on the BMW M3, allows you to select ‘comfort’, ‘active’ or ‘dynamic’ roles for the engine, steering and suspension responses, then also lets you custom tailor them to your own package of preferences. All new A4s also have daytime running LED halo lights that don’t dazzle oncoming motorists or render motorcyclists invisible. I couldn’t really tell anything much from around 10 miles in the 1.8TFSI Multitronic. Just that it’s uncannily quiet and the only noises felt in the cabin were the thumping of tyres from the occasionally broken road surfaces we were driving on. I got on a lot better with the 1.8TFSI manual that I took on a short 27 km handling route through the mountains. It has a sweet enough engine and it turns-in, grips and handles more fluidly than A4 B6s and B7s. You can get plenty of pleasure from driving it, but there’s still a small trace of lumpiness at the front emphasised by a shortage of torque. These aren’t big problems and don’t irritate, but the car isn’t quite as finely balanced as the new Mondeo. Great looking. Comfortable, with those clever Audi seats that don’t feel quite right when you first sit in them but which you thank when you finally step out of the car without a twinge. It’s also beautifully made, of course, giving the feeling of solid, long-lasting quality. It cruises sweetly in 6th at 30mph per 1,000rpm. And at 480 litres the boot is huge. But three adults can’t sit across the back seat for long (even the Mazda 2 has better centre rear headroom). And they still haven’t fixed the cable gearchange I complained about on the A5, so it’s very easy to wrong-slot especially between 3rd and 5th. Next, a tale of two quattros, both 3.0 V6 TDIs, both manual, both the same colour, both on Michelin Pilot Primacy HP tyres, and both with the latest quattro system that works on a 60/40 rear bias that in theory should kill understeer. Both also had Audi Drive Select. Yet in ‘dynamic’ the first car seemed to understeer when I booted it out of the apex of bends. I complained, was taken on a test drive by a former German rally driver who demonstrated that there was nothing wrong with it on a slalom course. And maybe there wasn’t. Maybe I just hadn’t selected ‘dynamic’ mode properly. Or maybe the roads I drove it on had bends with tightening radii that naturally force any car into understeer, even quattros. So, with half an hour of testing left, I took the second 3.0 V6 quattro on the same Michelin Pilot Primacy HP tyres on the same 27 kilometre handling route at the 1.8TFSI. And that turned out to be my kind of car. The gearchange was still far from perfect. But the engine was much more lively then the first. And the ‘dynamic’ setting worked as a quattro should, pulling the car into the bend from the apex instead of scrubbing off speed running wide. 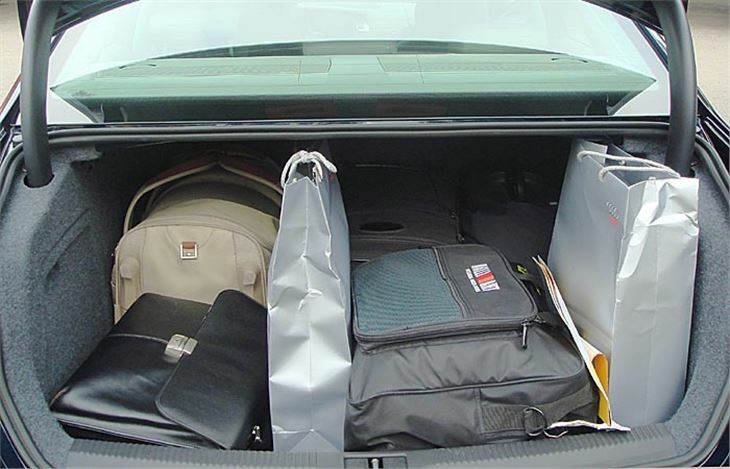 Bags of grunt too, from 240PS and 500Nm torque from 1,500rpm to 5,000. It’s long geared in 6th at 40mph per 1,000rpm. And with C02 within Band E (£165pa), together with a potential 40.9mpg, you could almost make sense of the money sums too. Then next day at 7.00 in the morning, I finally got the opportunity to drive the 2.0 and 2.7 TDIs on the 27km route. The 2.0TDI 143 was absolutely fine. Better, in my opinion, then than the 1.8T because it had bags more grunt to pull the tall gearing of around 32.5mph per 1,000rpm in top. Yet even though it had a heavier engine it also seemed better balanced in the turns then the 1.8TFSI. And the gearshift was fine as well. I hitched ride back to the airport in the same car and it passed the back seat test too. Combined with the better fuel economy, lower VED (£115pa) and lower BIK it’s definitely worth the extra £1,400 over the 1.8TFSI. 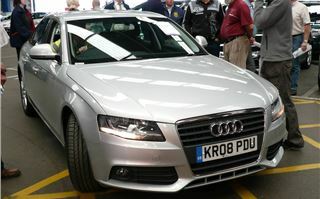 Finally, the 2.7V6 TDI Multitronic, again front-wheel drive, but with the benefit of Audi’s latest 7-plate clutch CVT. That was lovely, shifting seamlessly on the steering wheel paddles and left-foot braking smoothly into the turns. It could be driven very quickly indeed without alerting passengers to the velocity they were travelling. It worked well left to self-select too, effortlessly picking up speed to overtake slow moving trucks, and later, on a long twisting descent, stuck behind another car it also offered over-run braking. Unlike other autos left in ‘drive’, this works like selecting a lower gear in a manual and retards the car just enough that you don’t have to brake all the time. A very useful unexpected feature. Not only that, being CVT rather than torque converter, it’s a low £165pa Band E VED. Common sense and a surprising level of ability say it has to be the 2.0TDI. Bur for frugal fun, if you have to have an automatic, then stump up the extra six grand for the 2.7TDI Multitronic. 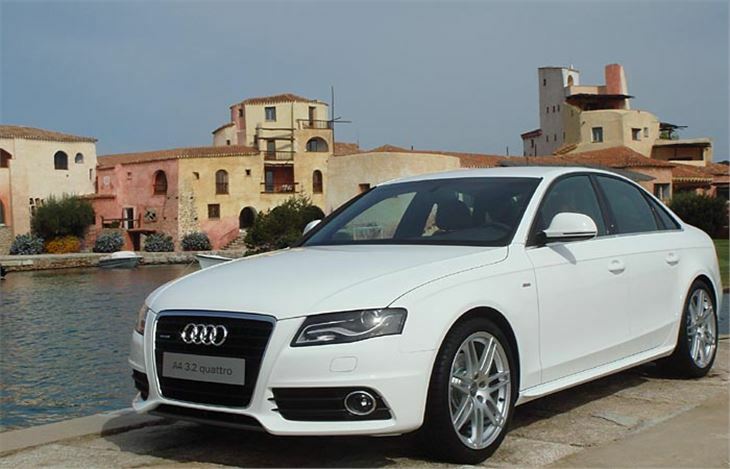 In the third week of January 2008, Audi invited us back to try RHD versions of the A4 B8, with the same engine line-up of 2.0TDI manual, 2.7TDI Multitronic and 3.0TDI quattro. The roads most definitely had, because instead of Sardinia this was Portugal, and a 75 mile mountain route consisting mostly of corners. As before, the piezo injected 2.0TDI was delightful, gripping at the front far more tenaciously than any front drive A4 has ever done before. And ours was on the sensible standard 17” wheels with 225/50 R17 tyres. Nice steering too, that automatically tightens up the faster you go so there was never any need to cross arms. And sensible gearing in 6th of 32.5mph per 1,000rpm. Not too tall, yet not too low either. And the engine will pull from around 1,000rpm in third, even on a slight incline. Very like a Bluefin chipped 2.0TDI 140 PD. Next, a solo drive of the same route in the 3.0TDI quattro and pretty much the same experience as in Sardinia. It has ample grunt, and with 6th gear to 40mph per 1,000rpm, has potential for decent economy on the motorway. Yet even with the ESP switched off and ‘Dynamic’ selected for engine, steering and suspension in Audi Drive Select, it still seemed to understeer more than the front-drive 2.0TDI. This, of course, is a quattro characteristic. Enter the corner, aim for the apex, then floor it to power out and kill the understeer. But you can’t do that when you’re not sure how long the corner is going to be, or what you might meet coming in the opposite direction. 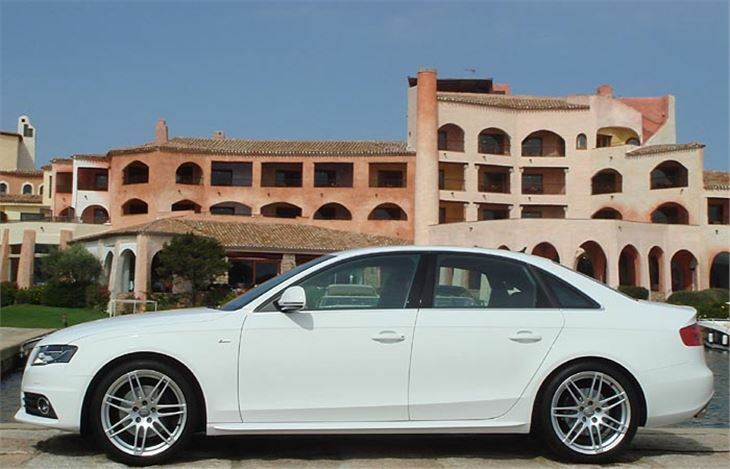 The longer wheelbase of the B8 quattro increases its tendency to understeer. So, though it’s still a safe car, easily collected if you get it wrong and no problem to keep on your side of the road, it’s not the most fun to drive of the three car’s tested. That accolade, like the last time, goes to the 2.7TDI front-drive Multitronic. Switch it to paddleshift and you have eight ratios to play with and instant shifts between them. On a constantly twisting mountain road, you soon learn which ratio you are in. But instead of mostly third gear in the 3.0 quattro manual, you have 3rd, 4th, 5th and 6th to play with, so there’s never any excuse for bogging down out of a corner. This car really sang, sitting in the 2,500 – 3,500 rev range, never needing more than 4,000, fluidly linking the corners together in an almost balletic manner. Sheer pleasure, never a moment’s worry, seemingly more front-end bite than the quattro because you can always be in the right gear to accelerate out of the bends, and not too bad on fuel economy either with the 8th ration giving 37.5mph per 1,000rpm. As before, the cheapest 2.0TDI is no poor relation. 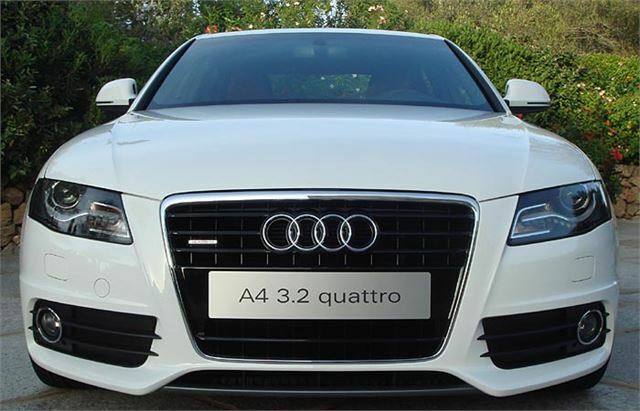 But if you’ve got more money to spend, don’t lay it out on the 3.0V6 quattro. Go for the 2.7 front drive Multitronic instead.